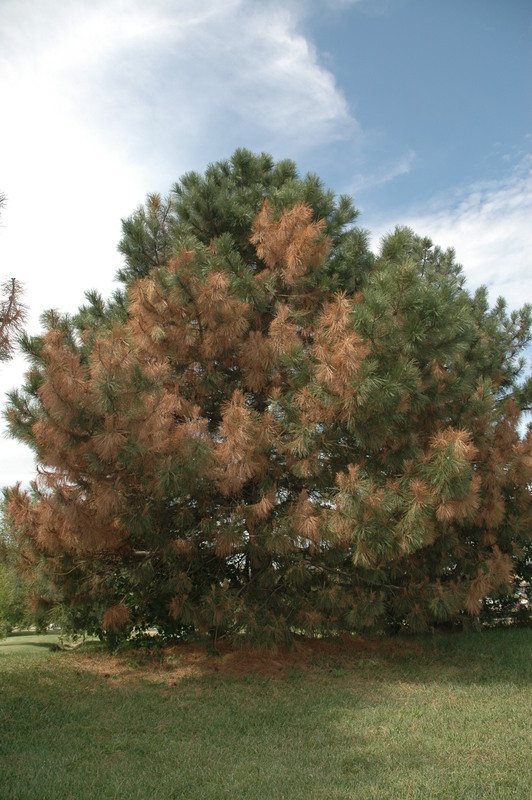 Pine tip blight – Is it happening in a tree near you? I’m seeing some pine candles just starting to emerge. Are YOU seeing any shoot growth yet? Newly emerging pine shoots are susceptible to tip blight, so here is a yearly reminder of the nuts and bolts of this disease. The classic symptom of tip blight is stunting and browning of new shoots and needles, as shown in the two photos above. 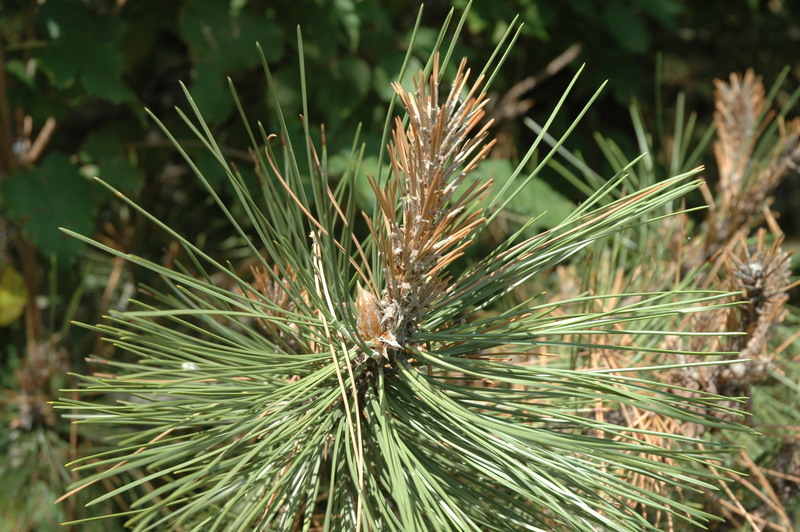 Pine tip blight is a fungal disease that can affect Austrian, Scots, ponderosa, and mugo pines. The disease is most severe on mature trees (20 years or older). Repeated infections over several years can kill large sections of trees or entire trees. Here are some Frequently-Asked-Questions about tip blight. 1) What is the pathogen? 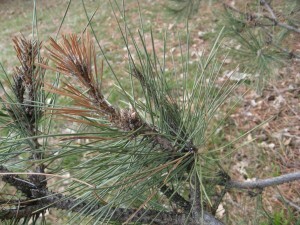 2) When does pine tip blight occur? Tip blight is a spring disease. The fungus survives the winter in previously-infected tissue. Then, during spring rains, the fungal spores splash around and infect the newly developing pine shoots (candles) just as they start to grow (usually in mid-late April). 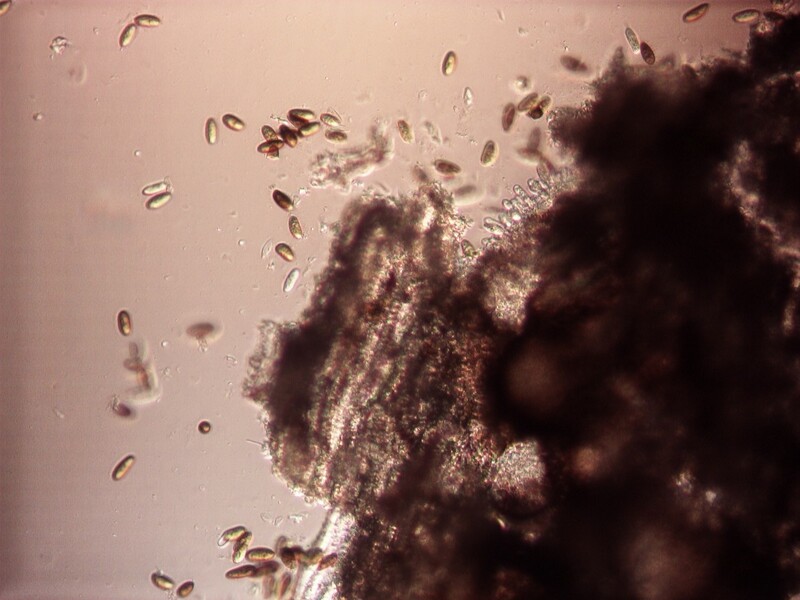 Pine tip blight spores in the microscope. Spores are spread during spring rains, and they infect new shoots. 3) What are the symptoms of pine tip blight? The symptoms become obvious in late May or early June when the infected shoots and needles are not growing right. The shoots are stunted, and the emerging needles are stunted and brown – see the photos at the top of this post. Small, sticky resin droplets often form on the infected needles. The damage usually starts in the lower branches and works its way up over several years. In trees that have been repeatedly infected for many years, damage is distributed throughout the crown. In addition to infecting the newest growth, the fungus can invade older tissues when trees are highly stressed or if they are wounded (by hail, storm damage, etc). Tip blight can affect older wood along with the newest shoot tips. This photo shows both. In this tree, the tip blight fungus has invaded some older parts of the wood, resulting in major tree damage. Interestingly, white pines are not susceptible to the tip blight phase, but they are susceptible to this “canker form” of the disease if they are wounded. 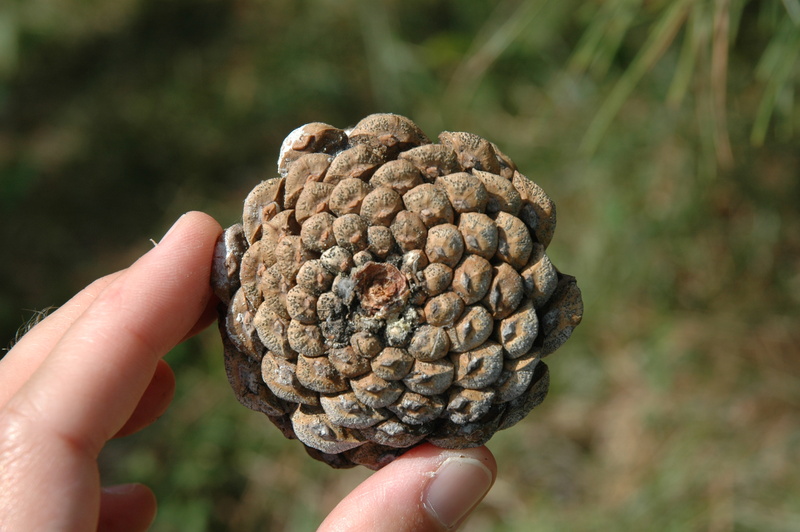 In late summer or fall, tiny black spore-producing structures (called pycnidia) are formed on the scales of 2-year-old cones — it looks like black pepper has been shaken onto the undersides of the cones. Tip blight on cones. Click to zoom, and you’ll see black specks. Those are the fungal spore-producing bodies. 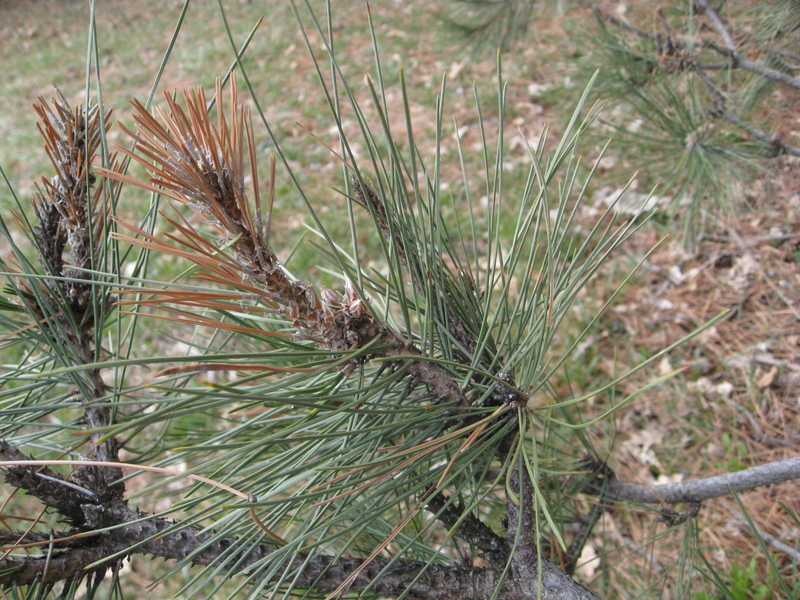 Tip blight can be confused with winter damage or infestation by the pine tip moth. However, winter damage usually causes shoot or needle death before the new needles emerge in the spring, and it is sometimes restricted to one side of the tree (the side facing the prevailing wind). Unlike tip blight, the tip moth causes a hollowed-out area in the tip/bud area, and the larvae are sometimes present. Plus, tip moth is more common in young trees. The timing and pattern of symptoms, and the age of the tree, can help you with the diagnosis. 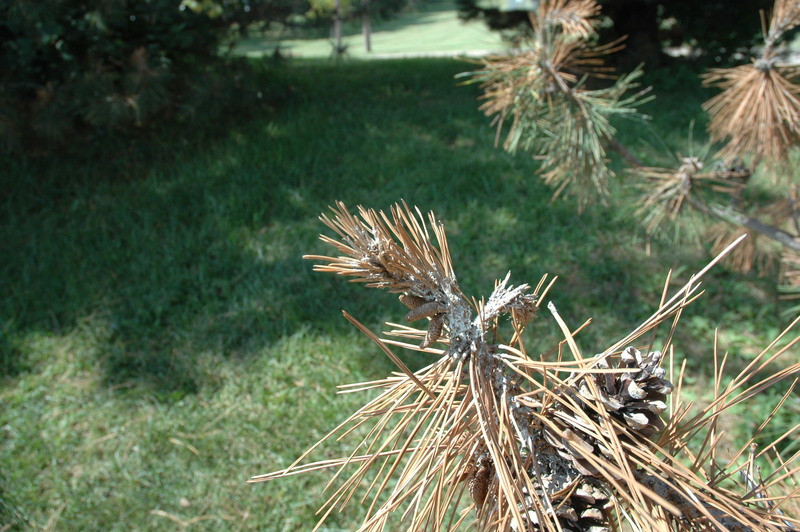 In extreme cases tip blight can be confused with pine wilt. To avoid confusion, look carefully at the symptoms and compare them to the descriptions and photos here and in other resources. 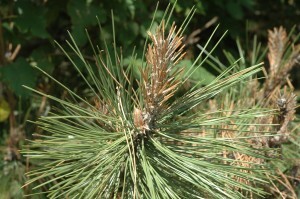 Pines can be infected with both diseases simultaneously. If there is any doubt, bring a sample to your local K-State Research and Extension office to be forwarded to the K-State diagnostic lab. Removal of dead branches can improve the appearance of diseased trees but will not prevent infection. Many of the spores are produced on cones that remain attached to the tree. In addition, tissues that look healthy can secretly harbor the tip blight fungus. That is, there are “hidden infections” that we can’t even see. Usually, pruning for tip blight means pruning off lower branches first, since they tend to be the first to become infected. Then the pruning task moves up the tree as the disease progresses over the years. If a tree reaches a point where it is no longer pleasing or functional for the site, “one-cut pruning” (ie, tree removal) might be the best possibility. 5) What other tree care should I provide? Trees should be adequately (not excessively!) watered to maintain tree vigor. This will help a tree fight off tip blight on its own. When a tree is drought stressed it has less energy and resources to put into defenses against pathogens. 6) Will a fungicide be effective? This is a tricky question. The trouble is, unlike smaller plants like wheat, tomatoes, or soybeans, there aren’t many studies out there to tell us about tip blight “thresholds.” As a general rule, if a tree has at least 30-50% of branches infected, the fungus is pretty well entrenched and it will be difficult for fungicides to reduce disease, even if used over multiple years. And, if there is a lot of “canker” type infection in older wood, it is hard for fungicides to work. If a smaller portion of the canopy is affected, and it is mostly the “tip-blight” phase, fungicides are more likely to be successful over time. Finally, consider the aesthetics and site-enhancing value of the tree. In trees where the disease is caught early, and fungicides are used at the right time each year for multiple years, the disease can be reduced over time. 7) Okay, so what is the right time for fungicides? If you opt to use fungicides, the critical time for fungicides is when the new shoots are expanding in the spring. If fungicides are applied at this time, new disease can be prevented. It is not a one-shot-deal, however, and not even a two-shot-deal. Fungicides will likely be needed each year to protect new annual growth. Each year, the first application should be made when new shoots start to elongate, which is usually around the third week of April. The tree should be sprayed again 10 to 14 days later, and possibly again 10 to 14 days after that if it is a wet year and the site has a history of disease. The timing should be adjusted slightly depending on host development in the spring, since every year is different. Spraying after this critical time will not be effective, because infection has already occurred and cannot be “cured.” Once you see symptoms it is too late. Every year I get a question or two from someone wanting to spray in later summer or fall, and that is not going to work. 8) What should I spray, and how should I spray it? The user must read and follow all label instructions. Fungicide injections have been studied, but so far results have been inconsistent/ineffective and injections are not recommended at this time.